Colored screen print edited by Sunday B. Morning, printed with inks of excellent quality and posthumous of Andy Warhol's disappearance. 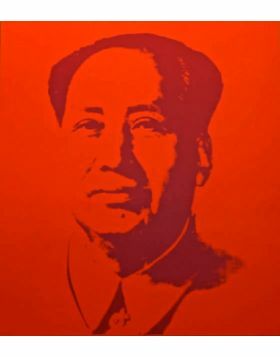 Starting from an image taken from Mao's famous red book, with this series Andy Warhol wants to criticize capitalism's first enemy, the leader of chinese Communism Mao Tse-tung. Despite the repetition, every screen print becomes an entity thanks to different colors which alter face and expression of the character filling him with different emotional valences. At the same time Warhol seems to want to take away every semantic valence from the worldwide icon to reduce him to a simple decoration. Screen print authorized by Sunday B. Morning and printed using high quality inks after Andy Warhol's death. 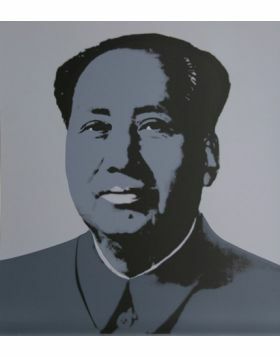 With the image of Mao, Warhol underlines the relationship between his art and the critics towards consumism. Capitalism and comunism are two opposite ideologies within the same artwork. 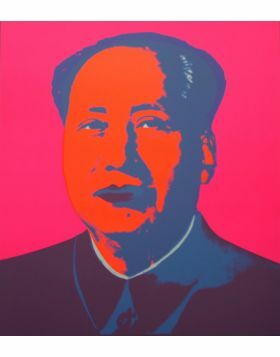 Mao, is painted with lively colors and with a friendly appearence, even if american society is facing the end of the cold war. 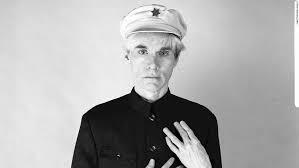 The critics of Warhol is directed towards capitalism and its cabability of taking everything and givingit back to the society with other forms. 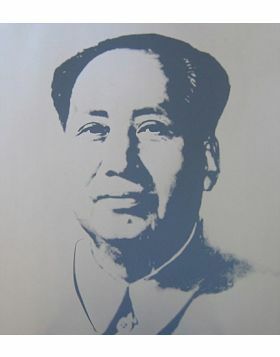 Warhol transform Mao Tse Tung into a pop icon, just like Marilyn.